In 1962 an intrepid group of businessmen and curlers took on the task of erecting a curling rink in the area, and in the fall of 1963 the curling season opened at the Lancaster and District Curling Club. A ladies’ auxiliary was formed, and those early years brought many happy times of good curling, good friends and good fun. In 1978 one executive was installed and a more cohesive group worked at the many improvements. Outside Invitational Spiels such as the Fisherman’s Bonspiel, Mixed and the Ladies’ Spiel established Lancaster as the place to be not only for competition but also for the delicious servings of Lancaster Perch. At the present time, an active and progressive executive continues to make curling enjoyable. 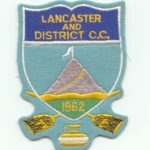 In October 1962 a contest was suggested to local schools to design a crest. The crest was to incorporate local history or heraldry. The winning design created by local student Murray Munro, included the famous Lancaster Cairn. The logo is still used today and well recognized in the curling communities of Eastern Ontario and Western Quebec.